A new study says large animals such as elephants are no more or less fit for survival than tiny microscopic species. There are more than 8 million species of living things on Earth, but none of them - from 100-foot blue whales to microscopic bacteria - has an advantage over the others in the universal struggle for existence. In a paper published today (Jan. 8) in the prestigious journal Nature Ecology & Evolution, a trio of scientists from universities in the United States and the United Kingdom describe the dynamic that began with the origin of life on Earth 4 billion years ago. They report that regardless of vastly different body size, location and life history, most plant, animal and microbial species are equally "fit" in the struggle for existence. This is because each transmits approximately the same amount of energy over its lifetime to produce the next generation of its species. "This means that each elephant or blue whale contributes no more energy per gram of parent to the next generation than a trout or even a bacterium," said co-author Charles A.S. Hall, a systems ecologist with the College of Environmental Science and Forestry (ESF) in Syracuse, New York. "We found, rather astonishingly, by examining the production rate and the generation time of thousands of plants, animals and microbes that each would pass on, on average, the same amount of energy to the next generation per gram of parent, regardless of size. A single-celled aquatic alga recreates its own body mass in one day, but lives for only a day. 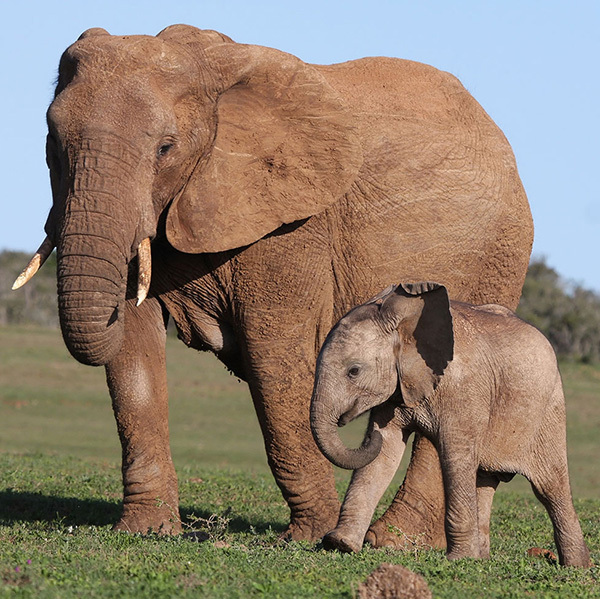 A large female elephant takes years to produce her first baby, and lives much longer than the alga. For all plants and animals of all sizes these two factors - rate of biomass production and generation time - exactly balance each other, so each contributes the same energy per gram of parent to the next generation in their lifetime." The bottom line, Hall said, is that all organisms are, on average, equally fit for survival. Hall's co-author, James H. Brown, a physiological ecologist at the University of New Mexico, said, "The fact that all organisms are nearly equally fit has profound implications for the evolution and persistence of life on Earth." The third author on the paper, which was published online, is mathematical biologist Richard M. Sibly of the University of Reading in the United Kingdom. The scientists tackled an intriguing question about life on the planet, beginning with some common knowledge. On one hand, they noted, microscopic, unicellular bacteria, algae and protists that weigh only a few micrograms live fast, generate much new biomass per day or even per minute, and die young, often within hours. On the other hand, mammals such as a 100-foot blue whale can live up to 100 years but generate new biomass, including babies, much more slowly. The authors ask a sweeping question: How can such enormous variation in reproduction and survival allow persistence and coexistence of so many species? Their answer: Because there is a universal tradeoff in how organisms acquire, transform and expend energy for survival and production within constraints imposed by physics and biology. In their research, the authors built a model of energy allocation, based on data involving rates of energy investment in growth and reproduction, generation times (commonly considered 22 to 32 years for humans) and body sizes of hundreds of species ranging from microbes to mammals and trees. They found an exactly equal but opposite relationship between growth rate and generation time among all these organisms. The net result is what the authors call the "equal fitness paradigm." Species are nearly equally fit for survival because they all devote the same quantity of energy per unit of body weight to produce offspring in the next generation; the higher activity and shorter life of small organisms is exactly compensated for by the slower activity and greater longevity of large organisms. Hall said the tradeoff between rate of living and generation time is one reason for the great diversity of life on Earth: No one size or life form has a built-in advantage over another. The apparent benefits of being larger (for example, bigger males are more likely to win in competition for mates) are compensated for by the fact that larger animals are typically less productive over time. "There is no single way of living and using energy that is best," Hall and Brown said. "Given the array of environmental conditions on the planet, one kind of organism might gain a temporary advantage, but such gains will soon be countered by other, competing organisms. The result is what evolutionary biologist Leigh Van Valen called the 'Red Queen phenomenon,' based on Lewis Carroll's Through the Looking Glass: All species must keep running to keep up with others and stay in the evolutionary race."